The Blackwell Companion to the New Testament is a detailed introduction to the New Testament, written by more than 40 scholars from a variety of Christian denominations. David E. Aune is Professor of New Testament and Christian Origins at the University of Notre Dame. He has been a Fulbright Professor at the University of Trondheim, Norway, has held an Alexander von Humboldt Research Prize at the University of Tübingen, Germany, and was the Annual Professor at the Albright Institute of Archaeological Research in Jerusalem. He is the author of several books, including The Westminster Dictionary of the Literature and Rhetoric of the New Testament and Early Christian Literature (2003) and Revelation (3 vols., 1997-8). Introduction (David E. Aune, University of Notre Dame, Indiana). 1 The World of Roman Hellenism (David E. Aune, University of Notre Dame, Indiana). 2 The World of Early Judaism (Judith H. Newman, University of Toronto). 3 The Archaeological Setting (C. Thomas McCollough, Centre College, Danville, Kentucky). 4 New Testament Greek (Christophe Rico, École Biblique et Archéologique Française de Jérusalem). 5 Reconstructing the Text of the New Testament (Michael W. Holmes, Bethel University, St. Paul, Minnesota). 6 The Canons of the New Testament (Leslie Baynes, Missouri State University). 7 Historical Criticism (David E. Aune, University of Notre Dame, Indiana). 8 Literary Criticism (David E. Aune, University of Notre Dame, Indiana). 9 Form Criticism (David E. Aune, University of Notre Dame, Indiana). 10 Feminist Criticism (Amy-Jill Levine, Vanderbilt University). 11 Rhetorical Criticism (Duane F. Watson, Malone University, Canton, Ohio). 12 Social-Scientific Criticism (Jerome H. Neyrey, SJ, University of Notre Dame, Indiana). 13 Socio-Rhetorical Interpretation (Vernon K. Robbins, Emory University, Atlanta, Georgia). 14 The Problem of the Historical Jesus (Dale C. Allison, Jr. (Pittsburgh Theological Seminary). 15 The Synoptic Problem (Patricia Walters Rockford College, Illinois). 16 Q: The Sayings Source (Ronald A. Piper, University of St. Andrews, Scotland). 17 The Gospel of Mark (Jens Schröter, Humboldt University, Berlin). 18 The Gospel of Matthew (Dennis C. Duling, Canisius College, Buffalo, NY). 19 Luke--Acts: The Gospel of Luke and the Acts of the Apostles (Richard P. Thompson, Northwest Nazarene University, Nampa, Idaho). 20 Johannine Literature: The Gospel and Letters of John (John Painter, Charles Sturt University, Australia). 21 Paul and his Letters (Jouette M. Bassler, Southern Methodist University, Dallas, Texas). 22 Paul's Letter to the Romans (Thomas H. Tobin, SJ, Loyola University, Chicago). 23 1 Corinthians (John Fotopoulos, St. Mary’s College, Notre Dame, Indiana). 24 2 Corinthians (Calvin J. Roetzel, University of Minnesota, Minneapolis). 25 Galatians (Mark D. Nanos, Rockhurst University, Kansas City). 26 Philippians (Paul Hartog, Faith Baptist Theological Seminary). 27 Colossians (Troy W. Martin, St. Xavier University, Chicago, and Todd D. Still, Baylor University, Waco, Texas). 28 1 Thessalonians (Karl P. Donfried, Smith College, Northampton, Maine). 29 2 Thessalonians (Edgar Krentz, Lutheran School of Theology, Chicago). 30 Paul's Letter to Philemon (John R. Levison, Seattle Pacific University). 31 Ephesians (Margaret Y. MacDonald, St. Francis Xavier University, Antigonish, Nova Scotia). 32 The Pastoral Letters: 1 and 2 Timothy and Titus (David E. Aune, University of Notre Dame). 33 The Letter of James (Paul A. Holloway, University of the South, Sewanee, Tennessee). 34 1 Peter (Brian Han Gregg, Sioux Falls University, South Dakota). 35 2 Peter and Jude (Kevin B. McCruden, Gonzaga University). 36 Hebrews (Craig R. Koester, Luther Seminary, St. Paul, Minnesota). 37 The Apocalypse of John (David L. Barr, Wright State University, Dayton, Ohio). 38 New Testament Apocrypha (Petra Heldt, Hebrew University of Jerusalem). 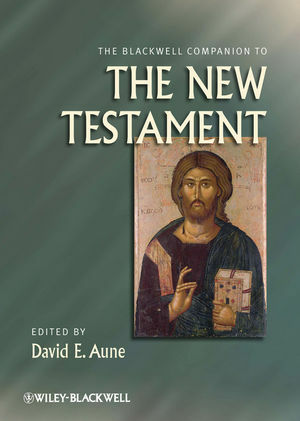 "A concise and authoritative guide to current critical scholarship on the New Testament … offering 16 sharp and well-focused thematic essays on NT backgrounds, canons, and critical methods followed by 21 chapters addressing the critical agenda for the individual books of the NT,and a wonderfully informative chapter on the NT apocrypha. Sharp enough to engage the attention of seasoned scholars in the field, yet concise enough to whet the appetite of students, each essay makes a distinctive contribution in its own right and offers a select but well-chosen bibliography for further exploration. An indispensable resource."